Assemblymember Rob Bonta and David Erlich. THE CANDIDATES Two years ago, Democrat Rob Bonta participated in one of the most grueling races in the East Bay. He fought off two strong opponents to win the primary and then continued the hard-fought race into the fall before finally beating Abel Guillen. Bonta appeared battle-tested when he arrived in the Assembly and was the only freshman to snag a committee chairmanship. In the 18 months since, Bonta has proven to be a strong defender of labor and has taken a lead in the state for reducing gun violence…Republican David Erlich says part of his reason for running is merely to deny Bonta the chance to run unopposed. The San Leandro resident often combined rock-ribbed conservatism with a dash of Tea Party-laced conspiracy. Earlier this month, he warned of the United Nation’s Agenda 21 as it pertained to Plan Bay Area, the grossly unpopular 30-year regional transportation and housing plan approved last year. QUOTABLE “If we say we have a budget surplus of $2 billion, we’re lying to ourselves when our local municipalities are going to go broke unless we fix this problem,” Erlich said at a candidate’s forum in May. BY THE NUMBERS Voter Registration: Democratic 63.2%; No Party Preference 18.2%; Republican 8.4%. Campaign Finance: cash on hand thru May 17: Bonta $418,719; Erlich, no report filed. 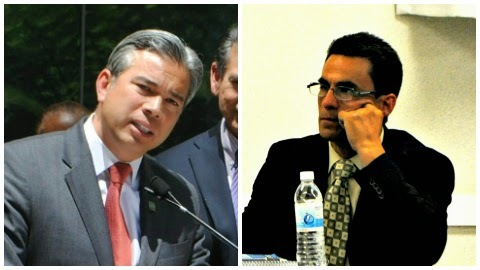 2012 Primary Result: Rob Bonta (D) 36.9%; Abel Guillen (D) 29.7%; Joel Young (D) 18.8%; Rhonda Weber (R) 14.6%. PREDICTED ORDER OF FINISH 1. Bonta 2. Erlich. ON TO NOVEMBER Most East Bay experts believe Bonta will win anywhere between 75-80 percent of the vote. Either way, since there are only two candidates in this race, a replay in November is assured. Bonta isn’t sweating. In fact, the most intriguing number from primary day is which Oakland official will win a higher percentage—Bonta or Rep. Barbara Lee in the 13th Congressional District? 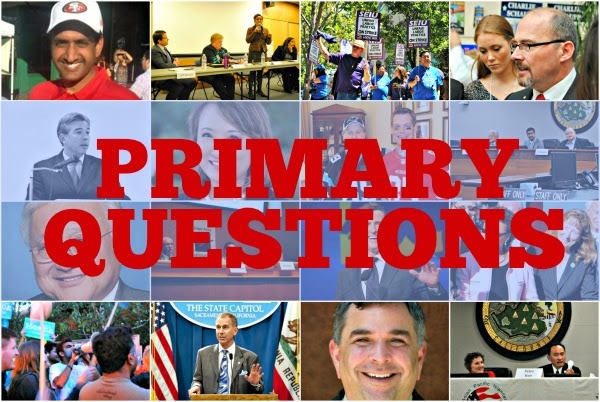 Posted in #AD18, Abel Guillen, Assembly, Assembly committee, David Erlich, June primary, Oakland, primary questions, Republicans, Rob Bonta, san leandro. Bookmark the permalink.